The item below is taken from the script of a news report on Flemish TV channel VTM. It concerns the re-arranged court hearing in the Landuyt/Museeuw case. I hope it is only a pizza Johan is ordering. STORY: The cyclist Johan Museeuw, six fellow riders and four other people, including chief defendant, veterinarian Jose Landuyt, are accused of importing, possessing or using endurance-boosting drugs EPO and Aranesp. Prosecutors in the Belgian city of Kortrijk on Thursday (September 27) read out the series of charges, demanding a two year sentence, half of it suspended, for Landuyt and fines for Museeuw and the other “immoral” cyclists. “We want to give a clear signal to the world of cycling,” prosecutor Wouter Haelewyn told the court. The drugs harmed the body and were designed to give those that took them an unfair edge in competitions, he said. Landuyt, former cyclist Jo Planckaert and two others were present to hear the charges read out. Museeuw, three-time winner of the famous Paris-Roubaix race, was only represented by his lawyer. Museeuw admitted to taking performance-enhancing drugs towards the end of his career in a news conference in January. Considered the best one-day cyclist of recent times, Museeuw, 41, has already been banned for two years by the Belgian federation over his alleged involvement. Landuyt’s lawyer, the first to respond to prosecutors, decried the leaking of charges against his client over the past two years and ridiculed allegations that Landuyt was the head of a “hormone mafia”. His client, he said, had committed errors, but had also sought to encourage rides to take homeopathetic products, rather than potentially damaging drugs. The case involved four-years of investigation, with telephone tapping and a number of police raids. 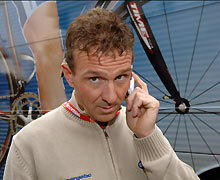 Investigators counted over 200 calls and mobile text messages between Museeuw and Landuyt over a short period of time. Why is Johan sweating, feeling guilty? We have all been there haven’t we? You have just one more lap to do and you could be a winner. But on the last climb the elastic snaps and a small group goes up the road taking with it your hope of victory. Poor Oscar, he rode the perfect race but Bettini was just too strong. Much as I wanted Oscar to take the jersey I can’t begrudge Bettini the win. He was clearly the fastest sprinter in the group but he kept on attacking all the way to the line. Of the others Valverde’s decline continues. What a difference a year makes. Whatever his secret was he now lacks it which is encouraging for the sport’s recovery. My outside bet Philippe Gilbert was, as always, a contender but still lacking that magic ingredient. What to make of Schumi having a swig from his bottle in the last kilometre? I’m no expert on hydration but it was probably too late to make much difference! Nerves I guess. No wonder Oscar is smiling.